On October 7, 2014, a groundbreaking and blessing ceremony for the next-generation Thirty Meter Telescope (TMT) will launch a multi-national $1.4 billion project near the summit of Mauna Kea, Hawaii. Although access to the TMT construction site will be limited due to the area’s sensitive environment and harsh physical conditions, the ceremony will be fully accessible via a live-stream webcast. George Takei, noted actor, director and author, known for his role in the television series Star Trek, will present pre-recorded science segments during the live webcast. Dr. Robert Hurt, researcher, science podcaster and lecturer, will host the webcast, available at tmt.org/buildingTMT . “This is an exciting moment as we begin construction of TMT. Its giant mirror, nearly 100 feet across, promises the highest definition views of planets orbiting nearby stars and the first stars and galaxies in the distant universe,” said Edward Stone, Executive Director, TMT International Observatory. The TMT International Observatory (TIO) is an international partnership with members comprised of the California Institute of Technology, the National Astronomical Observatories of the Chinese Academy of Sciences, the National Institutes of Natural Sciences in Japan, and the University of California. 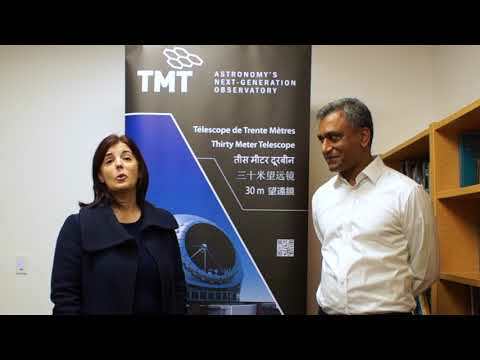 India recently received approval from the Union Cabinet of India to join the TMT project this fall, and Canada is aiming to join as a member in spring 2015. Initial activities in Hawaii include site preparation and grading, and offsite work has begun in earnest as well. In China, partners are designing the telescope’s fully articulated main science steering mirror system and developing the laser guide star system. Japan has produced over sixty special zero thermal-expansion glass mirror blanks for the main mirror and is designing the telescope structure in detail. Fabricating the mirror support system is ongoing in India. The adaptive optics facility is in final design and the enclosure is ready for construction in Canada. The mirror control system is in final design in California. Henry Yang, TIO Board Chair and Chancellor of the University of California Santa Barbara, will deliver the October 7 groundbreaking and blessing program’s opening remarks followed by Hawaii Governor Neil Abercrombie and Hawaii County Mayor William Kenoi. A traditional Hawaiian ceremony will conclude the program. The webcast will begin at 11:15 a.m. HST on October 7, 2014. Visit TMT.org/buildingTMT to watch the ceremony live stream, explore event information, connect via social media, and view the multimedia archive of the event afterwards. Viewers worldwide may send greetings to TMT (@TMTHawaii) via the hashtag #buildingTMT .